Lloyd Braun is the childhood neighbor and lifetime rival of George Costansa. Lloyd has outshined George his whole life, leading his mother to constantly say “why can’t you be more like that Lloyd Braun.” Lloyd Braun is played by two actors, Peter Keleghan in the Non-Fat Yogurt, and Matt McCoy in the Gum and the Serenity Now. Lloyd briefly dates Elaine after meeting her with George at a Non-Fat Yogurt stand. A big advisor to Mayor Dinkins, Lloyd takes Elaine’s suggestion that everyone in the city should wear name tags to be more friendly. Dinkins takes the advice and loses the campaign. Publicly humiliated, Lloyd suffers a nervous breakdown and spends time in a mental institution. Following the breakdown, Lloyd enlists the help of Kramer, in an attempt to gain historical status for the Alex theater. The Alex was built in nineteen twenty-two, during the golden era of movie palaces. Minor restorations in nineteen forty-one, forty-seven, fifty-two, fifty-eight, sixty-three, and currently to our present period of time. Kramer is sensitive to Lloyd’s condition and tries to protect him from people calling him crazy. The miscommunication causes Lloyd to mistakenly purchase $100 worth of chewing gum for Jerry from his Chinatown connection. Lloyd also worked a short stint as a computer salesman for Frank Costanza. After killing George on the big sales board it is revealed that Lloyd actually made no sales, the phone having not been connected the entire time. Lloyd Braun: Oh! I asked Mr. Dinkins if he knew any good orthopedists, and he said he had the best. So, I made an appointment for you. Dr. Dekter. Estelle Costanza: Mayor Dinkins got an appointment for him? 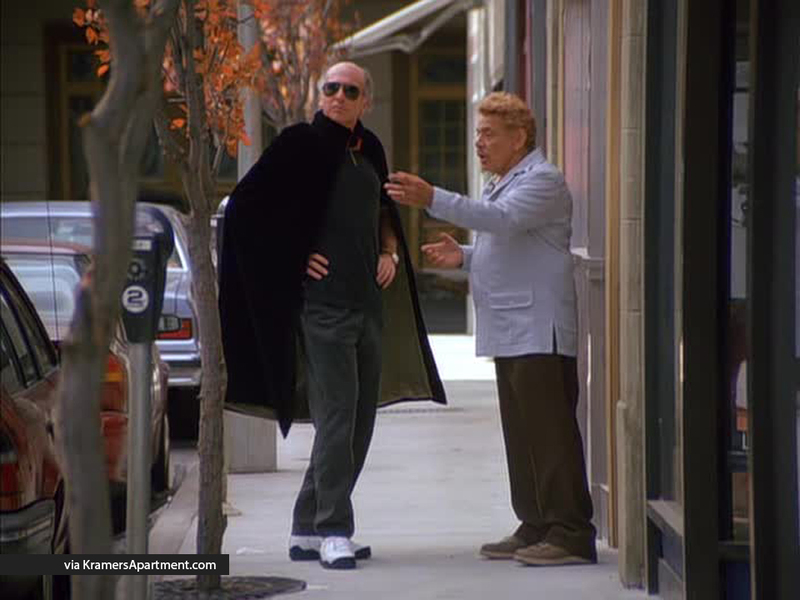 Frank Costanza: You mentioned George’s name to Mayor Dinkins? You discussed George with the mayor of New York? Estelle Costanza: Dinkins was talking about you. He was discussing you. George Costanza: You know, Lloyd, I-I’ve been to the doctor there’s really nothing they can do. Frank: Hey, Mayor Dinkins set this up for you. You know what kind of a doctor this must be if Dinkins knows him? George Costanza: All right. All right! I’ll go. Lloyd Braun: Well, that’s great. And, uh, I’ll be very interested to hear the diagnosis. Elaine Benes: So, anyway, you’re a big advisor to Dinkins, huh? Lloyd Braun: Yeah, yeah. It’s coming right down to the wire. Elaine Benes: Wow! You know what I would do if I was running for mayor. One of my campaign themes would be that everybody should wear name tags all the time to make the city friendlier. Lloyd Braun: Name tags, hmm? Elaine Benes: Well, everybody would know everybody. It would be like a small town. Lloyd Braun: Maybe I’ll mention that to him. Kramer: Now see, this is what the holidays are all about. Three buddies, sitting around, chewing gum, huh? Mmm, mmm, yeah. So uh, you know, Lloyd, he thinks he can get more of this. 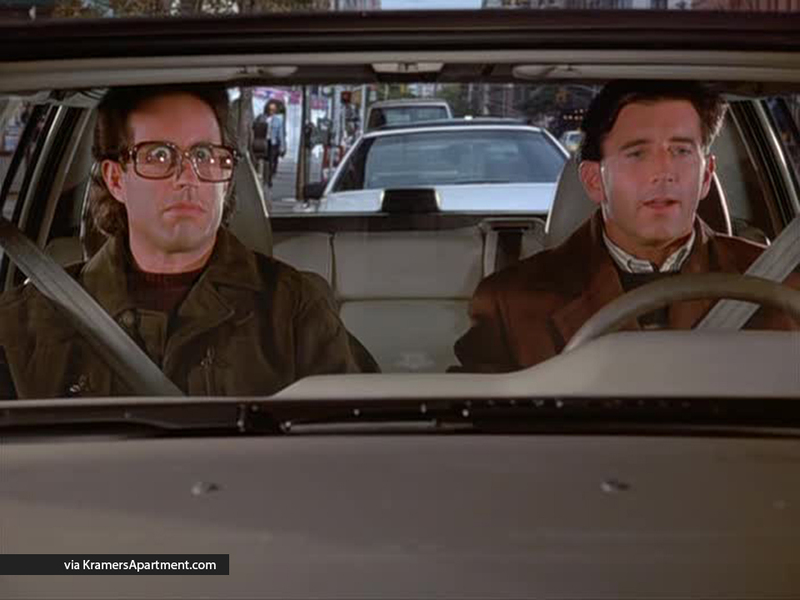 Jerry Seinfeld: Well, Lloyd’s a very industrious fellow. I’m sure he can accomplish anything he sets his mind to. Lloyd Braun: Actually, the importer’s right in Chinatown. I’ll introduce you to him, you can get it whenever you want. Jerry Seinfeld: It’s not necessary. 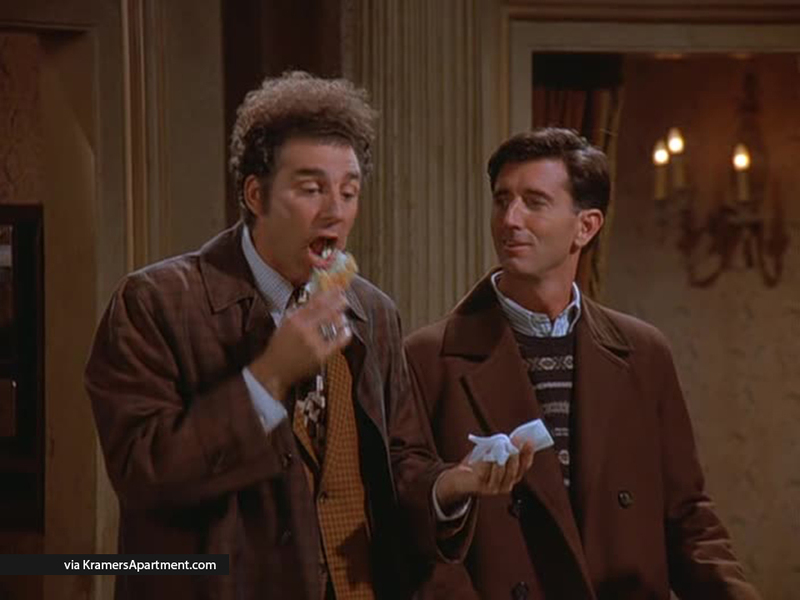 Kramer: Hey, Jerry, you know, Lloyd wants to do you a favour. Lloyd Braun: That was odd. Am I crazy, or does Jerry not wear glasses? 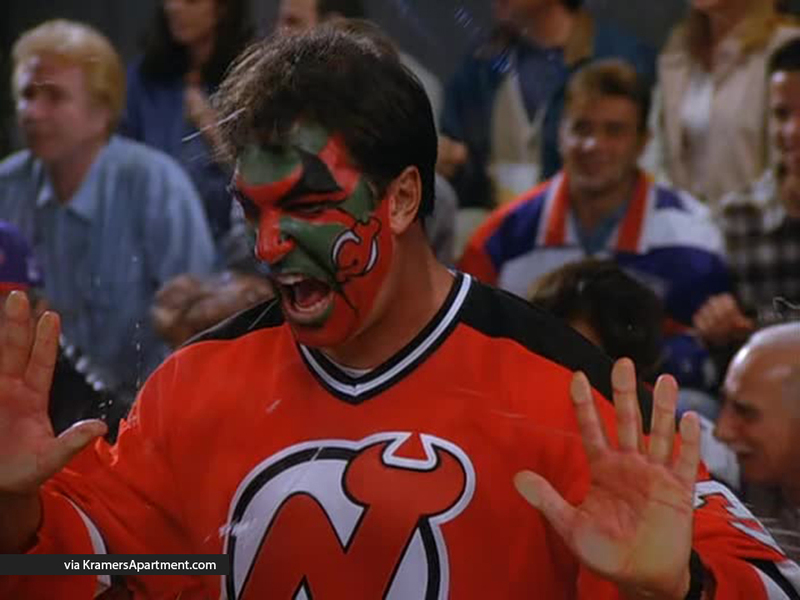 Kramer: You’re not crazy. Jerry does wear glasses. He just forgot ’em, that’s all. Not crazy. Lloyd Braun: Hey gum-buddy. Nice frames. You ready to go? 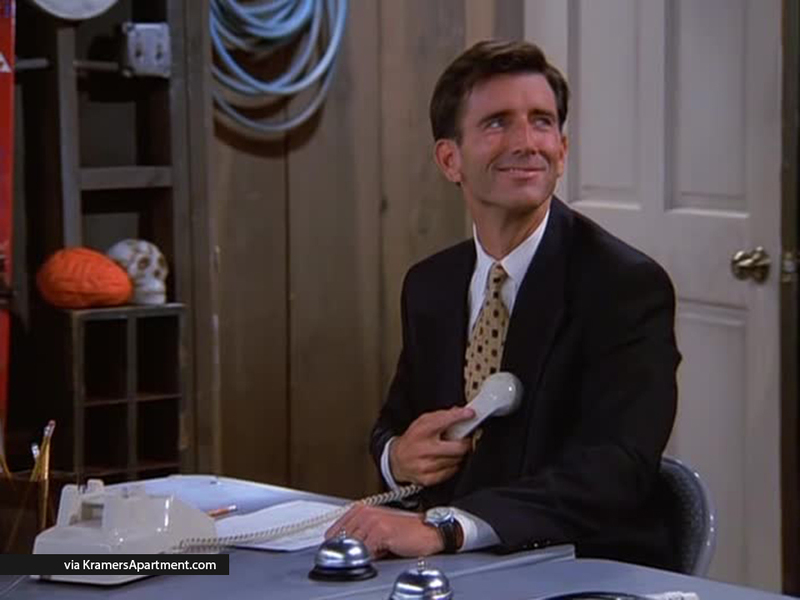 Lloyd Braun: Another sale, Mr. Costanza. Chalk me up on the big board. 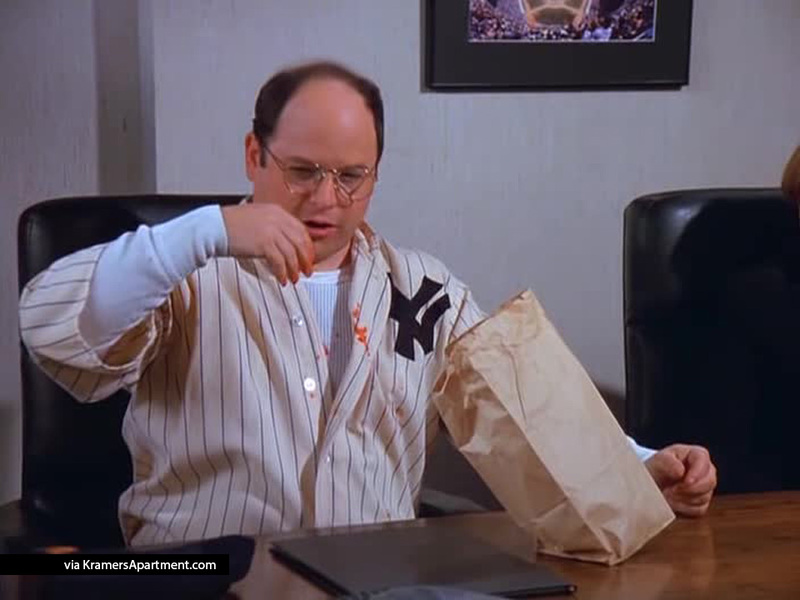 George Costanza: What do you know? You were in the nut house. Lloyd Braun: What do you think put me there? George Costanza: I heard they found a family in your freezer. Lloyd Braun: Serenity now. Insanity later.